bushing, type PAP … P10/P11. The KS PERMAGLIDE® materials P10 (with steel back) or P11 (with bronze back) are used, depending on the aggressiveness of the gas or liquid..
temperatures. If used frequently – or indeed rarely – the function of the isolating valve must not be impeded. The bearings are no longer accessible once installed, and so maintenance-free bearings are required. if the pressure is too high, the isolating valve opens. 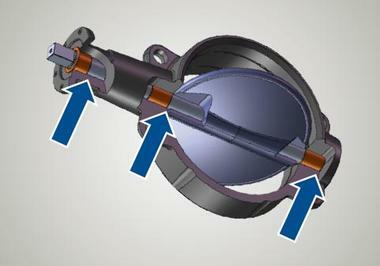 If a section of the pipeline is leaking, the isolating valve closes. The shaft journal and the valve disc are mounted with KS PERMAGLIDE® P10 or P11 plain bearing bushes. The P10 and P11 plain bearings do not become electrostatically charged, as they act as electrical conductors after runningin. The isolating valves can also be used in environments where there are explosive gases.